According to the legend, when Buddha reached enlightenment he invited all the animals to celebrate their joy. The Tiger and 11 other animals went to that invitation and they got to be included in the Chinese zodiac, as a prize. How do I know if I am a Tiger? As we have indicated before, each animal ‘governs’ a specific year. The years of the Tiger are: 1902, 1914 1926, 1938, 1950, 1962, 1974, 1986, 1998, 2010… and thus consecutively adding 12 years to the previous figure. In the Chinese Horoscope, the Tiger is impetuous, impulsive and dynamic. They are people who simply do not know how to be still and constantly need new stimuli. Their passionate nature prevents them from stopping and analyzing situations, which sometimes puts them in complicated situations. They are beings who like justice to prevail and they will not hesitate to defend the weaker when necessary. They are innate leaders. 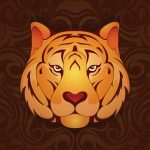 Passion: People born in the year of the Tiger of the Chinese Horoscope are the classic ones that you would follow at the end of the world even if you do not have a clear idea of the end. Everything they do they do with passion, constantly fighting against everything that is necessary to achieve the desired end, however crazy it may be. In the Chinese Horoscope they are innate leaders. Endowed with a strong character, they do not allow themselves to be intimidated by anyone. They are strong and they know it but at the same time they like to use their strength against the strong and act as protectors of the weak. Tenace: If they want something, they get it. Those born in the year of the Tiger of the Chinese Horoscope with the influence of water are honest and fair. They enjoy a lot of confidence in themselves but do not use it to intimidate others but to ensure that things are done fairly. Despite the passion that characterizes the Tiger, the water element makes him more calm. The Tiger under the influence of wood is the typical party companion we all want to have: bright, fun and full of energy. However, there is much more under that façade of an affable person. Actually, they are people who need a lot of support not to feel insecure. They are pure energy and passion. Their gift becomes their Achilles heel because sometimes they do not take the time to stop and analyze themselves. People born under the influence of this element in the year of the Tiger enjoy the small pleasures that life offers them. They are excellent life lovers. They are ambitious people who would not hesitate to set aside whoever gets in their way.